CD Projekt RED and the community. v1.01 Fixed old Wolven pants and added file for the red scarf on the Cidarian/Thyssen/Oathbreaker/Redanian Halbedier armor's. v1.02: Used a workaround to fix the Superior and Mastercrafted version of the Bear Pants! v1.03: Added texture.cache as a modder's resource and to hopefully fix some incompatibilites. In patch 1.21, CDPR has changed the colors for the Witchers sets in order to make way for their new dye system introduced in Blood and Wine. The change in color is of very questionable taste, so I brought the old colors back from the old files. Dyes won't work with this! 1. Which sets does the update change? 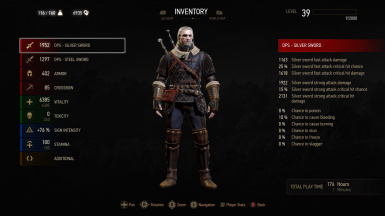 It affects the Wolf, Bear, Cat, Feline, Griffin, Kaer Morhen and Viper sets. 2. 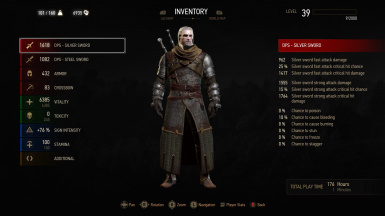 Does this mod reverts all four tiers of armors or just the mastercrafted version? It reverts all four tiers to their original state (pre-1.21). 3. What about the Grandmaster version? 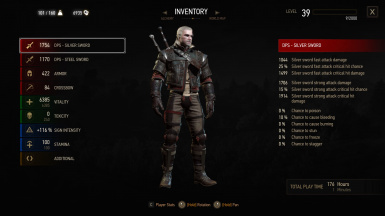 The grandmaster version wasn't in the previous versions of the game and was designed for Blood and Wine, therefore there is no original pre-patch version. If you use AMM and the grandmaster armors happen to be bright red, you can use this to prevent that. 4. Is this compatible with other pre-patch reskins? 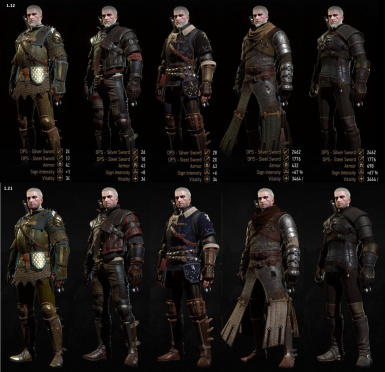 Texture mods are most likely going to work as long the reskin you want has higher priority than this mod. 5. I prefer the new colors. Simply remove the mod from the Mods folder to uninstall.